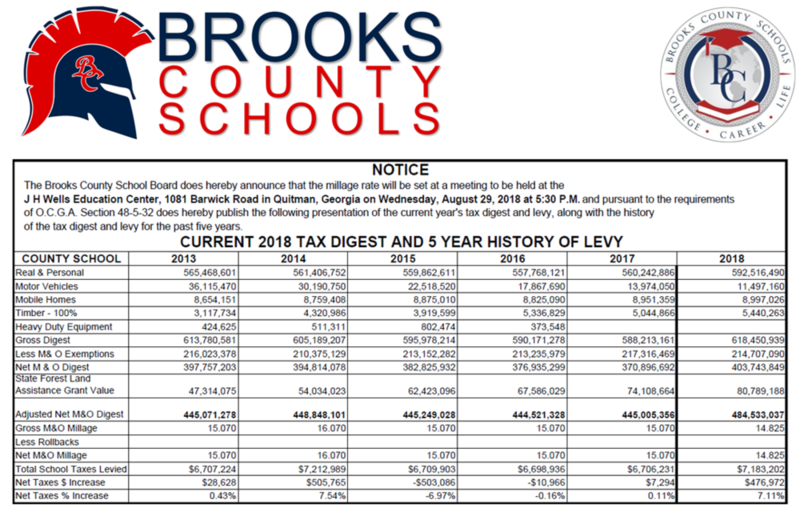 The Brooks County School Board does hereby announce that the millage rate will be set at a meeting to be held at the J H Wells Education Center, 1081 Barwick Road, in Quitman, Georgia on Wednesday, August 29, 2018 at 5:30 P.M. and pursuant to the requirements of O.C.G.A. Section 48-5-32 does hereby publish the following presentation of the current year's tax digest and levy, along with the history of the tax digest and levy for the past five years. Click here for the tax digest.